The US intends to sell a billion dollars-worth of arms to Saudi Arabia, including some $670 million-worth of anti-tank missiles, despite criticism of the Gulf state’s war in Yemen, in which 10,000 civilians have been killed. 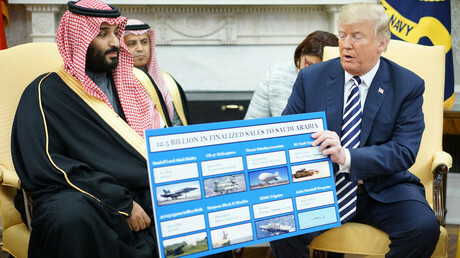 In his meeting with visiting Crown Prince Mohammad bin Salman Al Saud (also known as MBS) on Tuesday, President Donald Trump boasted about an imminent multi-billion-dollar sale of arms to the kingdom. According to the State Department, Saudi Arabia applied to buy over 6,500 TOW 2B anti-tank missiles on Thursday. The package deal also includes helicopter maintenance services and spare parts for military vehicles. The sale would safeguard the security “of a friendly country which has been, and continues to be, an important force for political stability and economic growth in the Middle East,” the State Department said in a statement. The US is a major supplier of arms to Saudi Arabia. Back in May 2017, Trump visited the kingdom, signing a record $350 billion arms deal, the largest in US history. The announcement comes as the Saudi leader embarks on a marathon tour of the US, in a campaign to build commercial and political ties. His itinerary has included meetings with Vice President Mike Pence and soon-to-be-replaced National Security Adviser HR McMaster. He will spend the next two weeks courting senior business and technology figures from Wall Street and Silicon Valley. Saudi Arabia is currently embroiled in a war against Yemeni rebels, which has left tens of thousands of civilians dead and brought the Middle East’s poorest country to the brink of famine. The Saudi-led coalition has launched a bombing campaign to re-install the Saudi-backed leader, who was toppled in a coup by the Houthi Shia rebels in 2015. The UN has deemed the ongoing conflict in Yemen a “humanitarian crisis” and has called for an immediate ceasefire. In addition to selling arms to the Saudi government, the US has also provided intelligence, fuel and other assistance to the bombing campaign. Last week, US Army General Joseph Votel admitted that the US does not monitor how the weapons it supplies to Saudi Arabia are used in Yemen. Like this story? Share it with a friend!